Check out my thoughts on the book, for what they're worth, below, and then make sure to stick around and enter to win! 1) I try my best to give a book multiple chances when it's not working for me -- I don't have a super happy DNF trigger finger (though it does itch from time to time). 2) BUT that said, I know myself as a reader, and I know when I'm unlikely to enjoy a book. Life is short, and I've grown unwilling to force myself to finish something that I'm not enjoying. 4) When I've decided to DNF a book, and still "review" it, I try to make sure I've read enough of it to feel like I've got a handle on the things I want to say, and a clear indication that it's probably going to remain so throughout the book. In this case, I stopped at about 25% of the way through, which is a bit shy of the 100 page mark. *Probably the biggest issue: I couldn't help but find it cheesy. Everyone has different triggers and levels of tolerance for this, so the things that bothered me may not bother you. BUT I found myself rolling my eyes quite a bit more than I'd like, especially for the amount of pages I read. I found the names cheesy (the types of names I would have come up with and been very pleased indeed with myself in middle school); I found the setup and the way the conflict between these two factions was kind of talked around a good bit before it was actually addressed, and I found it cheesier when we were given info, always in very obvious setups and clumsy attempts to work the info-dumping into dialogue. (This is generally something I appreciate, but it's gotta be subtle. This ... was not.) And I found cheesiest of all the main character, Echo; her interactions with others, and really, her entire being. And I felt this was likely to get worse. *And it was this cheesiness that lead to the death knell: I was indifferent. I couldn't connect, and there came a time that I just had to admit to myself that I'd been putting off reading it for a month, and hadn't been reading anything else because I didn't want to let myself get sucked away and find excuses not to finish it, and that it was just dragging down my reading pile for the month of May, when really, did I even care what happened? I did not. I couldn't make myself care about these characters and their war, and their search for the "firebird;" I couldn't get past the jarring way that their otherworldly and high-fantasy selves didn't mesh with their uber-modern, carefree styles of interaction, and how I was never quite able to believe in any of them, at any time, enough to take a leap into the world and begin building my willing suspension of disbelief. I just couldn't. And so that is why I had to give up. I am hoping that if I set the book to the side for a good long while, enough to clear my head of it and reconcile myself to what it actually is, versus what I was hoping it was, that I can come back to it and try again. Maybe like it more than I have this time around. Maybe even enjoy it. I'm borderline curious to see what is actually going on in this world, and I want to know what the fuss was about for my friends that have read and loved this. But for now, I know that any further reading is just going to make me resentful, and ruin any chances of me liking this down the road, so I've got to let it go. For now, at least. But if that hasn't scared you off, and you're still excited to read it (and why not? You may love this! ), then I do wish you the best of luck in this . . . 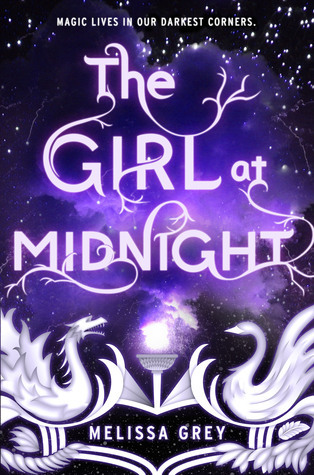 The awesome folks at Penguin Random House, who sent me this book to review, have offered up 2 copies of The Girl at Midnight to two lucky readers! This giveaway is open in the US and CAN, and ends May 29th at 11:59pm EST. I have been seeing this book around in the last week and I like the cover. I usually like a book that I am drawn to from the cover. There are not too many books that I cannot finish, but there have been a few. Thanks for your honest opinion and for this giveaway!! I've seen this book a whole lot on booktube and goodreads. I love that you gave your honest opinion about the book even if it's not what everyone else agrees with! I find that there are two main reasons for dnf'ing a book. Sometimes I like the story idea but I just don't connect with the writing style and sometimes I like the style but can't connect with the characters or story. Sometimes we just have to give up. Why do we always feel so guilty about it? Thanks for the honest review. I definitely think the conflict needed more explanation. This book has seemed to be a hit or miss for most reviews I've read. I still want to read it because it sounds interesting but the similarities to other books has me worried about its originality and therefore how much I will like it. Thanks for your honest opinion! THE GIRL AT MIDNIGHT is a well rounded 1st book in a series. Readers are left with the perfect opening for a sequel or two, but I still feel this book easily stands on its own. Definitely recommend!